I'm not really one to be drawn into celebrity fragrances or those of a novelty factor so my expectations of the 007 fragrance for women* which hit stores last month were small. I'm also fussy about scents I enjoy but I'm pleasantly surprised that this is a hit and has gone straight onto my dressing table earning a place in my perfume rotation. This is the first product in the 007 line for women and long overdue. I think this is a lovely gift for any female Bond lover or of course the partner of a male fan - who doesn't want to channel their inner Bond girl? Bond Girls have earned their place in history due to their strong yet feminine characters with a mysterious air which the fragrance captures in a dark and oriental scent. It's another of the strong and sophisticated blends with a fruitiness that is adult rather than sweet. The 007 Fragrance for Women is housed in a very luxurious and high end black glass bottle which mirrors the male fragrance design of it's diamond cut pattern which apart from it's embossed 007 logo you could be forgiven it was from any number of high end fragrance houses. At just £24.50 for 30ml this is a fantastic bargain buy and a contender for Valentine's Day. 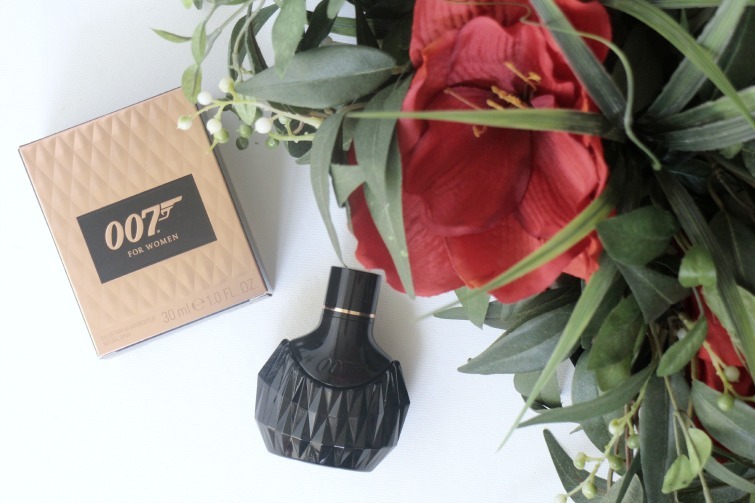 Are you a fan of the celebrity fragrances or indeed 007? Don't forget to share who your Bond is and favourite film. Don't worry I would've been equally as snobby that's what I love about blogging is that I try things I would've usually turned my nose up to! No, I'm not a fan of celeb fragrances, generally, although I do try to take as I find. I don't love the look of the bottle, I must say - it's a bit masculine for my tastes. Love a bit of Bond, though! Roger Moore is my fave, I guess because he was the one I watched growing up. I guess they're after a 'strong' masculine feel from it. I like Roger Moore too, what's the one Grace Jones where they're running around the Eiffel Tower, that's my fave film!